In the exciting world of public relations, the death of the press release has recently been discussed again. 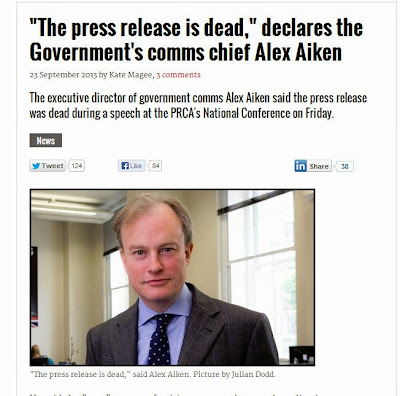 This time it was a UK government executive, Alex Aiken, who argued that press officers should become content producers and realise that tweets, infographics or videos may be a more relevant method of disseminating a message. That of course is a clever strategy if you want to bury the news, making it difficult for journalists to find the overview after the event as the original story is fragmented all over the place. I'll come back to this in a future post. Unfortunately, this madness is still going on. Let me explain. Part of my work involves writing and researching in the tech field. Several times a year I am bombarded by PR consultants who are simply interested in using me as an amplifier for their client. The problem is they have no clue about the context of the information they are trying to shift. And they have little understanding of how modern tech journalism works. The blame for this lies not only with the PR agency but also with the tech manufacturer themselves. Bright voices at the other end of the phone believe that success is being measured by the number of likes on a Facebook page, a retweeted Tweet, or the "column inches in a national newspaper". No-one ever measures if the message reached potential customers and whether, as a result, they decided to follow-up. After the latest International Broadcasting Convention in Amsterdam, I totalled up the number of press releases. This year I opened up a special Yahoo account to avoid PR pollution in my general inbox. I counted a total of 213 press releases related to IBC, about 80% of which were press releases written in a 1960's style that Tom complained about in 2006. I dumped them all after the show. Amsterdam, November 30th. At the AGM of Company X, CEO Dr Y announced that sales of their new 4K projector would 140% up on expectations....blah blah. But it gets worse. The arrival of the email release is often followed up with an urgent request that I book an appointment at the show with their spokesperson because their schedule is tight and there has been huge interest. I know, for experience, that if I take them up on the offer, I will often be hounded again after the show to report back on how many page-views the item generated or which networks it was used on. Otherwise I will be struck off their list of "influentials". Which is why I never respond to these mail shots and just glance at press releases. The material is so badly written that I would be a fool to quote from it. It is simply one source of input. I might use it to trigger an idea, that's where it ends. It is simply a shoutout, rather like a free flyer market traders keep shoving through my letterbox. I also laugh out loud at the agencies that are still putting physical press kits together, dumping CD-ROMs in the press-office. Which century are these people living in? My Mac laptop doesn't even have a DVD-player any more. So who didn't get the memo? As a tech writer and analyst I need a briefing not a press release. A useful backgrounder. Maybe a conversation with a specialist. In 2006 Tom Foremski concluded on what he needed. I would argue that much of it still applies to today. Deconstruct the media release into clear sections and tag the information so that as a publisher, I can pre-assemble some of the news story and make the information useful. Provide a brief description of what the announcement is about, but leave the spin to the journalists. The journalists will go with their own spin on the story anyway, so why bother? Cut the hype. Provide a page of relevant quotes from the CEO or other C-level execs. Provide a page of quotes from customers, if applicable. Provide a page of quotes from analysts, if applicable. Provide financial information in many different formats. Provide relevant links inside the press release copy to related news stories or reference sources. Tech manufacturers, PR agencies and the tech press seriously need new guidelines of engagement. They have to understand how to build narratives in a modern world where sharing has more influence than shouting. They need to abandon paper releases immediately. There are examples of tech companies that are getting it. In my view, SES-Astra was the best at IBC 2013. I believe that the clever PR agencies will re-examine what "relations" are all about. Until then, I will be chucking out hours of someone else's work. Or trying to get photos/video off a CD-ROM. Who is interested in a further conversation? Put me on the list. Worn Wear - Stories of things that lasted. Watching the nonsense of queues around Black Friday in the US. Why it is was great to discover the stories in the new film from clothing manufacturer Patagonia. Originally blacksmiths they make outdoor clothing designed to last. This film traces what happened to clothes that have been handed down. Beautifully filmed. And food for thought. It is also interesting in light of the discussion about the difference between stories and narratives in the John Hagel entry below. Note how the music in this film gently fades away - there is no closure because the clothes have not come to the end of their lifecycle. It's a snapshot of some fantastic journeys which are not yet over. When you have children, everything you have is theirs. But nothing they have is yours! Great line from this film, which I see has reached 100,000 people within a week. Had the opportunity to speak briefly with John Hagel III who came to the Netherlands as part of the Singularity University European Tour, visiting a seminar in Budapest and the Carre Theatre in Amsterdam as part of the homeward journey. I've followed Hagel for some years after meeting him for the first time at a SuperNova event organised by Kevin Werbach. Hagel has been studying how modern companies organise themselves and stimulate innovation. He has gathered plenty of evidence that most of the innovation happens at the edge of organisations and this was emphasised again at the Amsterdam presentation. Hagel has also recently given talks (famously without ever needing Powerpoint slides) to show that the most engaging stories are actually powerful narratives, and they are not the same thing. Deloitte, for whom Hagel has set up the Center for the Edge, has done some excellent analysis of modern storytelling, especially in startup companies like the ones I am working with. Well down into the Deloitte website, you'll find this page which explains why the difference is so important. One is that narratives are open-ended. They don't have resolution. There is something that is in the process of unfolding. The end is yet to be determined. And second, there's an invitation to all of us to participate in that narrative, to help determine what the outcome is going to be. It's yet to be determined and it's up to you, not up to them, not up to me, up to you as to how this is going to unfold and resolve itself. At the end of the day, if we get this right, the best way to think about the world is not seven billion mouths to feed, but seven billion minds to unleash. That's a powerful, powerful opportunity. Sadly, the audio on the video of the talk he gave in Austin is a struggle to listen to. But fortunately, Hagel's own blog goes into much more detail in an entry he posted last month. For me, narratives are related to, but different from, stories. Stories are self-contained – they have a beginning, a middle, and an end. Narratives on the other hand are open-ended – the outcome is unresolved, yet to be determined. Stories are also about me, the story-teller, or other people; they’re not about you. In contrast, the resolution of narratives depends on the choice you make and the actions you take – you will determine the outcome and you are therefore an integral part of the narrative. Narratives are typically about a broad domain rather than narrow slices of experience. Think about famous social narratives like the Christian narrative, the American narrative or the Silicon Valley narrative. I’ve talked about institutional narratives like the Apple narrative or the Nike narrative – the former is about the role of technology in re-shaping our identity in society while the latter is about our ability to move from passive observers of sports to active participants in achieving exciting new levels of physical performance. Whatever the level of the narrative, it maps out a broad domain. And, because it calls us to make choices and take action, it helps us to move beyond simple curiosity to a commitment to make a difference. But it does more than that, especially if it’s an opportunity based narrative. It identifies wonderful opportunities within that domain that are available to each and every one of us if we choose to pursue them. Narratives can help orient us towards a specific domain and encourage us to make a long-term commitment to that domain because of the exciting opportunity that awaits us there. But, it’s up to us. Will we make that commitment? Will we take the actions required to participate in that opportunity? Now, let’s look at questing dispositions. Opportunity based narratives are not just about opportunities – they also typically frame the challenges that we’ll encounter along the way. It’s not going to be easy. To participate in the long-term opportunity, you need to take on and overcome the challenges that await you. The dual focus on opportunity and challenges helps to draw out the questing disposition in us. Rather than trying to avoid challenges when they occur, narratives encourage us to seek out the challenges because we won’t be able to participate in the long-term opportunity until and unless we confront and overcome the challenges that stand between us and the opportunity. And what about the connecting disposition? Narratives tell us that the opportunity ahead is not just for one individual; it’s available to many if not all of us. We’re not alone in this. These are not zero sum opportunities where one winner crowds out all of the others. We can all participate in the opportunity. That message encourages us to come together to help each other over the finish line. The dissemination of the narrative itself helps to build up a community – or dare I say a movement? – of participantswho share a common excitement about overcoming the challenges that await on the way to a big and transformative opportunity. It cultivates a larger and larger gathering of people who are united by a shared commitment to a domain and an eagerness to confront and overcome the challenges ahead. As we see more and more people who share our excitement, we are much more likely to reach out and collaborate with others in overcoming the challenges ahead. So, opportunity- based narratives can be very powerful in catalyzing and amplifying the passion of the explorer. But there’s also a virtuous cycle here. As participants begin to acquire this passion of the explorer, they accomplish awesome things. The stories of their amazing accomplishments begin to spread and give additional credibility to the broader narrative – look at what others have accomplished, you can do the same or even better. Will you join us? Will you make the choices and take the actions required to pursue this exciting opportunity? The narrative is enriched by the experiences of others, spreads more broadly as others see the tangible evidence of what can be accomplished and acquires far more credibility. Now, not all of us will be drawn equally to any particular narrative. But narratives can become bright beacons calling us to reflect on whether the opportunity being framed is one that is meaningful to us as individuals. They are powerful antidotes to the institutions and practices we have today that discourage and ultimately squash passion in their quest for predictability, standardization and tight specification of all the actions we must take. They call us to re-connect with the passion we all felt as children and to move from the passion of the player that most of us had as kids to the passion of the explorer, motivating us to make a long-term commitment to a specific domain. Let me hasten to add that there’s a dark side to narratives. So far, I’ve been talking about opportunity based narratives. There’s another kind of narrative – threat based narratives. You know the kind – we’re increasingly surrounded by them. These narratives focus on an imminent threat – we’re under attack and if we don’t band together now, we’re all going to die or at least all the things we hold precious are going to disappear. Threat-based narratives are deeply conservative or even reactionary – they want to preserve what we have rather than explore exciting new opportunities. These kinds of narratives tend to ignite a different form of passion – the passion of the true believer. In this kind of passion, the destination is very clear and the path we all need to take to reach that destination is tightly mapped out. In contrast, the passion of the explorer has no idea what the ultimately destination will be much less the path that we will need to pursue to reach that destination – the key is simply to get started and to craft our own path with the help of others. Threat-based narratives and the passion of the true believer have combined throughout history to create many of the social movements that have wreaked havoc in our world. Nevertheless, even here the tight connection of narrative and passion helps to explain the power that these movements have exhibited. Why does all of this matter? As I’ve explored in the Big Shift,we live in a world of mounting performance pressure – it’s not going away. In that kind of world, we need to find ways to draw out sustained extreme performance improvement. We simply cannot do that without deep and widespread passion, as I’ve argued elsewhere. The problem is that, based on our recent research into passion levels within the workforce, only 11% of the US workforce has passion about the work they do. If I’m right, narratives can play a key role in drawing out passion, both within each of us and within our institutions. If we can’t find ways to re-connect with our passion as individuals, we’ll continue to feel mounting stress, become more and more marginalized and ultimately burn out and drop out. If we can’t find ways as institutions to tap into the passion of our participants, we’ll experience diminishing performance and ultimately topple out of existence. It doesn’t have to be that way. Narratives can create a very different world, one where pressure evolves from a source of stress to a source of excitement, calling us to achieve even more of our potential, both as individuals and collectively. By drawing out the passion that lies dormant within most of us, narratives can help us to accomplish things that we would have never believed possible. I realize from studying John's analysis that the most powerful presentations I've witnessed lately are not stories but narratives. They are open ended, engaging and there is a clear and passionate call to action. But the cause also has to be authentic - it's not a clever marketing trick to sell me a new product. At the moment, most of my clients will look aghast if I explain I'm a craftsman in the digital narrative. Digital story-telling will have to do for now. But in fact, I'm with John Hagel all the way. And European startups have to build much stronger narratives if they are going to get heard. For the moment, that part of the message has not yet gotten through. What are all these Media Network programmes doing here? There are very grey skies outside my window at the moment. And to think that the habour of Huizen was looking like this at start of last month. Ah well, time to process a lot of material captured when there was sun outside and sort out a number of hard disks that have been screaming for attention. I'm putting the final touches to the Media Network collection of radio programmes that traced broadcast and technology developments from 1980 - 2000. There are over 250 radio shows of 30 minutes in length sitting here. In the course of backing up some programmes, I discovered several dozen still waiting in a queue to be uploaded. What is the value in these programmes? I use them to check the rate of change in the broadcast industry and related media fields. I discover that we were talking about social media and actually using the web to collaborate long before Facebook, LinkedIn, and Youtube came along. But the fact that Google and Bing are indexing all this stuff makes it so much easier to find what I am looking for. I am disappointed that many people don't see the value of archives until it is often too late - they are destroyed or taken off line because of poor promotion - or there is no link made between the past and the present. Knowing how these programmes were made (low budget, high passion, and low fidelity transmission methods (shortwave radio) it is great to be able to listen back on demand. And several thousand people seem to agree with me. Here are 10 shows which went up today. No order. And that's the fun of it. It's time travel. This programme broadcast in February 1988 included news of the Philips D2999 shortwave portable receiver. Early models were recalled and modified, so we tested a new unit. We also included a test of the Philips D2935. There is also news of the conflict between Chad and Libya. John Campbell talks about transatlantic pirate radio stations. Andy Sennitt described catches during the heavy geomagnetic storm. On 3 July 1988, at the end of the Iran–Iraq War, an Airbus A300B2-203, was shot down as it flew over the Strait of Hormuz by SM-2MR surface-to-air missiles fired from the United States Navy guided missile cruiser USS Vincennes. The aircraft, which had been flying in Iranian airspace over Iran's territorial waters in the Persian Gulf on its usual flight path to Dubai, was destroyed. All 290 on board, including 66 children and 16 crew, perished. The only way of getting the Iranian side of the story was via shortwave from the Voice of the Islamic Republic of Iran. But the transmitter was only switched on mid sentence when we listened in. Radio Japan and Radio France Internationale have decided on a transmitter swap. NHK, for some reason, insisted on using narrow bandwidth phone lines so the audio sounded awful. Radio Bras also started relaying Swiss Radio International. We also talked to William Marsh about changes Radio Free Europe and Radio Liberty. He argued that dramatic events in the Baltic were not reported on by Soviet media. Radio Netherlands was also celebrated 300 years of Anglo Dutch relations. I went to the Dutch Postal Museum to discover that the Dutch East India Company had the right to read all the letters they were carrying. And they threw the letters from competitors into the sea. Sounds like an early NSA. (I remember that we were using a new brand of cassettes that week - but they were wrongly biased - hence the wierd sibiliance. In February 2000, Media Network experimented with a live webcast simply to see if the audience would react and could get a reliable audio feed. This is 10 years before Ustream or Google Hangouts. We had several hundred reactions, although by today's standards the audio quality was only marginally better than AM for most users. Remember dial-up? This programme which followed the webcast throough the regular shortwave and satellite channels analysed the results. This was a news show 1.6 million tune in to Radio Netherlands in Dutch during their summer holiday. WWV and WWVH have had problems with their automated time announcements. Drum recorders are back on line. Victor Goonetilleke has news about Cambodia. VOA is having challenges building its transmitters at a new site 50km North of Colombo. Why did we broadcast all these numbers? People forget none of the listeners had access on-line and only a fraction of the audience had access to printed DX bulletins. Andy Sennitt reports on what is in the 1992 World Radio TV Handbook. James Robinson reports that several UK local radio stations are leaving mediumwave. WLS 890kHz is scrapping its FM format. A new Catholic SW station WEWN was being built in Birminngham, Alabama. Dave Rosenthal reports on an experiment in McMurdo. Remember this show is 22 years old! This was a news edition of the programme, reporting on a bumper postbag from the UK as we started using the 1440 kHz outlet from Radio Luxembourg. We looked at how well the 120 different ethnic communities get access to the Dutch media. The participation of ethnic groups in mainstream media was improving. Arthur Cushen reports on what he could hear in Invercargill New Zealand. Radio Singapore International blocked by Chinese interference. We review two portable radios, the Sony ICF-SW40 and the Grundig Yacht Boy 360. This "clandestine" editon of Media Network checked the media accuracy of the gadgets in the James Bond Film, the Living Daylights. We found quite a number of mistakes. But then, James Bond is fiction guys!. Danish Radio decided to broadcast extracts from the book Spycatcher by Peter Wright. The book had been banned in the UK. Wright died a millionaire in 1995 after selling 2 million copies so it was clearly a good publicity move to have the book censored. Reminds me of the recent revelations about the NSA. WHRI is testing to Europe, but not announcing the frequencies they are transmitting on. The good ship Sarah is being prosecuted for transmitting from ship off the US coast. Wim van Amstel explains the radio regulations. Dorothy Weirs has a story about a clandestine station in San Salvador. This news edition of the programme also looks at the discussion in the UK about the licence fee for radio and TV from the BBC, Radio Luxembourg decides to pull the plug on all English language transmissions, Doug Boyd had a joke about audiences and apples, VOA has reduced its Spanish language broadcasts to Latin America. TWR Bonaire 800 kHz announces major transmission cutbacks on MW and SW. The programme starts with one of those classic Hallicrafters SW Radio commercials from the 1950's. Tony Jones is a Welsh radio enthusiast who emigrated to Paraguay in the 1970's. His name appeared in several DX magazines are a very active shortwave listener and specialist on the Latin American radio scene. He later went on to become one of the main editors of Passport to World Band Radio, a publication started by Larry Magne. I contacted him in late 1981 and asked him to give a presentation about the radio scene in South America at that time. We didn't have access to any station recordings, only music in the Radio Netherlands record library. So this time capsule episode would have been produced differently now. But it is an example of how the newly renamed programme was trying to do more reporting about media, rather than just times and frequencies. Welcome to the 1980's and an era when giant world expositions were in fashion. By finding the cheapest flight I could, I managed to persuade the RN programme director, Bert Steinkamp, to let me go and report on what was one of the last great expos. Radio Netherlands was, at that time, thinking of building a relay station in Asia. NHK Radio Japan was part of what I called the gang-of-five international broadcasters, although NHK was much larger than Radio Netherlands. The cheapest flight was via Sri Lanka, on Ari Lanka, which explains why I took the slow route to Japan in 1985 - but also had the opportunity to meet listeners in Colombo. Very glad I did - learned much more that just zipping over the North Pole. There is an excellent FEN report on Youtube which gives you some idea of the scale of the event. The Tokyo expo was actually in Tsububa, so I recall my first ride on the bullet train. One hundred eleven countries set up exhibits using the theme, "Dwellings and Surroundings - Science and Technology for Man at Home". More than 20.3 million people attended the three-month event. I was one of them. Wish I had had a camera. But I did have a microphone and help from NHK. Remember being amazed at how cramped everything was at Radio Japan. Roger Broadbent recently retired this year from Radio Australia. Many shortwave listeners know him from the many programmes he produced and presented for Australia's international broadcast network based in Melbourne. Some remember his voice on Radio Netherlands. He was with the English department for 15 years, leaving to return with his family to the Pacific. He set up most of the feature programmes during the reorganisation of the output in the early 1980's, as Radio Nederland concentrated more on information than music. Roger has always been a people person, a great colleague and someone who just got things done. He was a regular presenter on Media Network in the early years, along with Pete Myers. Just rediscovered the last Media Network he did with me before literally stepping on the plane for Melbourne. Remember this is 1986. If true, then the organisers heads should roll as well as Upshot. Especially as it was billed as the biggest hackathon prize in history. VPRO is one of the few Dutch public broadcasters making in depth documentaries and investigative items in the public interest. Most people don't know that there are often English versions of the montages put up on YouTube. Because they are not publicized at all, no-one knows this resource is there. Which is a real shame, because some of these insights are very interesting indeed. Exactly what a public broadcaster should be doing for discussions in society. I've been a fan of Douglas Rushkoff for many years, since he wrote a book called Media Virus. He was also a guest earlier this year on This Week in Tech's indepth interview programme Triangulation. I think the new GoPro HD cameras have done more to make exciting video footage in the last year than all other video camera companies put together. 449 Euro for a camera capable of producing 4K resolution. And people really know how to get the best out of it. Just as Sanoma media is doing a massive rethink about its publishing arm in the Netherlands, I personally feel that hyperlocal websites in this country are totally unsustainable. Not because they can't work - Brazil has proven that it can. It's just that the stories are so poor. 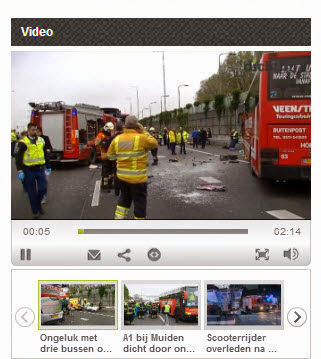 The only news on the local website DichtBij.nl are videos of accidents and medical teams clearing up. This isn't news I can use. It is just logging an event. As a local business I would not want to be associated with this collection of death and disaster. It will continue until the volunteers making this stuff realise there is no job at the end. Bumped in to an ad by Intel on Youtube which amused me. Not sure why Intel decided to make it impossible to download or embed. Not a clever strategy if you want anything to go viral. Interesting in the light of recent backlash in the UK against digital radio. TedXAmsterdam had a number of premiers this week. One was during a presentation about cultural differences given by management consultant Fons Trompenaars. He has a Dutch father and French mother and grew up being fascinated by how cultural heritage leads to misunderstandings - and lost business. Fons mentioned a website with more information about an Android app they have developed, but the URL seems to have been cut out of this version. http://www2.thtconsulting.com/tedx/ is the address you should head for. Bas van Abel, who is the Creative Director of the Waag Society's Open Design Lab shared a project they are working on to built a "fair phone", a modular smart phone that can be repaired and upgraded without throwing everything away. Dutch filmmaker and animator Floris Kaayk has been playing games on the media, treading the fine line between fact and faction. One of his most recent projects has been to create the character 'Jarno, the flying Dutchman'. He wrote blogs and made movies about Jarno, a guy who decided to build his own birdwings to become the first guy in history to fly like a bird. It was a great hoax, but it makes it all the more difficult for Floris to do a serious project in the future. Today I went to the Royal Concertgebouw Concert Hall in Amsterdam, along with around 1000 invited guests, to witness the 5th edition of TEDx Amsterdam. I must admit, after being to many such events over the last three years, I was beginning to wonder if the format of inspiring talks was beginning to wear thin. After all, it's over 10 hours of people talking at you - an avalanche of information. But I was so wrong. Here's ten hours compressed into two minutes. Etienne Abelin is a Swiss Musician who runs a startup business which is dedicated to using data visualization to add a new dimension to classical music. And not only in concert halls. The so-called Music Animation Machine has also been shown in Swiss Dance clubs. His talk is a bit difficult to follow at first because they left the reverb on from the choir. They gave out the 3D specs so you could see depth on the screens, though I personally don't think it was necessary....you can use different colours to create all the depth without the hassle of the specs. Change of continent. Peter Ngatia Nguura comes from Nairobi. He works for the African health organisation AMREF, though this talk could just as well have been to help the start-up network VC4Africa.biz. The message- trade not aid. Peter is someone who gives a passionate performance with his body as well as his voice. And talking to him afterwards he's a very gracious listener as well as an accomplished storyteller. I suggested that he add a few visuals. That part of Africa is so beautiful that some pictures would strengthen the talk in some places. Taking it from a 9+ to a 10. This was followed by a story of a fascinating cultural journey to communities that are in danger of disappearing. Photographer Jimmy Nelson has documented the existence of 35 unique communities in 44 countries, often travelling to very inhospitable, remote places in order to capture some wonderful images. The standard edition of the book is huge (29 x 37cms) - it was too large and heavy for me to even contemplate taking it home on public transport. As well as this "trade edition" for 128 Euro, he's also printed 500 copies of a giant XXL edition (42 x 59 cms) for a mere 6500 Euro. I asked him whether he had also captured any sounds during the travels. The photos are stunning. But I can imagine the sounds are just as valuable too, since these languages must also be under threat. Jimmy said that indeed he has a sound recordist and videographer on the trips, since the making of the photo is a story unto itself. It made sense to round off the first part of TEDXAMS with an illustrated talk by double bass player Dominic Seldis who is a member of the Royal Concertgebouw Orchestra. Together with violinist Borika van den Booren, he plays Valse Miniature by Serge Koussevitsky.Oh, and the preamble is brilliant. (e.g. his impressions of the Grand Prix and Seagulls 3 minutes in). Regular readers to this blog will know that I have my concerns with the TEDx movement as a whole. From its origins in 2009, TEDx feels to me like a marketplace for ideas rather than a movement. The number of events under the TEDx flag are still growing exponentially, so there is a lot of shouting needed to get heard above the noise. Currently there are 1143 TEDx events scheduled around the world, the majority taking place in North America and Europe. 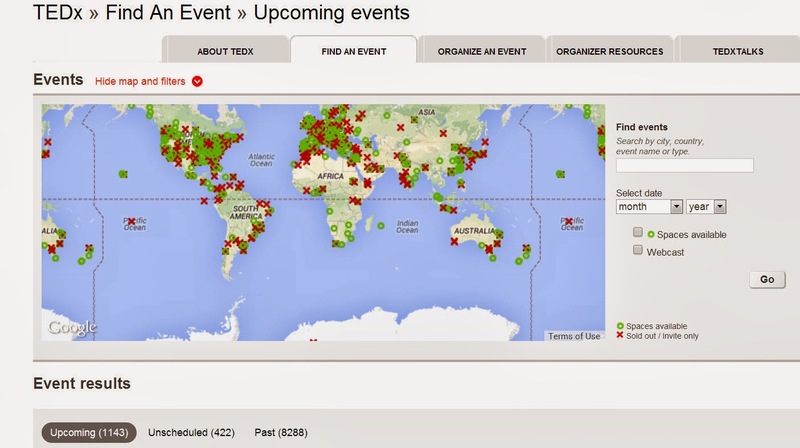 There have been 8200 TEDx events so far, and the TEDx website says there are 30,000 videos on-line recorded at TEDx events. In fact, the success is part of the challenge that lies ahead. The challenge for the TED movement is that the quality of these gatherings is very variable. Many are a thinly disguised business conference, or a city marketing bureau trying to show off. The organisers follow the TEDx format rather like a recipe book, usually overloading the day with far too many speakers, not giving the audience time for reflection. They have quickly become a cheap way for corporates to organise entertainment for their clients. There are a lot of business cards exchanged, but little in the way of action. However, this past week I did attend a TEDx event in Amsterdam which is gradually taking the concept in a different direction. From ideas worth spreading in the direction of ideas worth doing. From passive partnerships to active participation. At the moment the TEDx movement is still a loose network of very creative people. Anyone can apply for a free TEDx licence. They'll get it if they follow the rules. The goal for many on the TEDx stage is to get noticed by the TED conference organisers in the US. TEDx has no core leadership because it's purpose for most of those involved is all geared around an event format and the hunt for talent to fill the stage. The mother organisation which built the format around 18/5/3 minute inspiring talks is careful to distance itself from TEDx. Chris Anderson's intro video is a huge disclaimer incase the conference which follows turns out to be nothing like a TED event. On a visit to talent search visit to Amsterdam, I remember him saying that his approach of "radical openness" will not jeopardise the coherent message of TED. At the same time, TEDx is a huge ocean of talent from which anyone, including TED, can fish out new talent for the TED(x) stage. I see it a sort of chaotic three ring circus, where the good talent rises to the top. So what will happen next to this messy brand? At the TEDxSummit in 2012 in Doha, Hans Rosling (one of the most inspiring and downloaded speakers TED has ever had) gave an impromptu interview, following up from his famous washing machine talk. It must have been prepared because it was filmed in the typical TED style using multiple cameras (for easy editing). He starts by picking up from the conclusion of his washing machine talk, where he concludes that we're striving harder in the world to get washing machines into the world than to spread democracy. But at 2'00 in to the video he also said something extremely interesting about the challenge that's going to face TED very shortly. I believe it is happening now. TEDx is an emerging international civil society organization. It has enormous potential and the decision about the next step will be crucial. As it expands, friction will emerge as the discussion starts as to which direction it wants to go. Will it run projects, will it run education or will it (just) make statements? TED has built an industry around coaching people to deliver a better, clearer talk. It has polished performance and established a successful business model for itself. An elite will pay relatively large attendance fees to network (though a US$6000 dollar ticket is considerably less than the cost of a piece of research from one of the big four accounting firms). That helps to support the new talent given a once in a lifetime chance to share a brilliant concept, thought or idea. I still believe the weakness to both TED and especially TEDx is the follow-up. To continue to flourish, TED will have to professionalize that part of its business - you cannot leave it all to passionate volunteers. It needs a different group to do this - curators rather than event organisers. People who understand the value of coherent collections rather than just a wikipedia of brilliant ideas. A small core group of people need to build careers at TED or the goodwill will wear out. As a digital storyteller myself, so I wonder which direction TEDx will choose? Next post: What TEDXAMS got right. My friend and colleague Gerd Leonhard is right about many things happening at the moment. We're living in times which are moving forward logarithmically (8 is next to 4 not 5). And everything I trained for is either obsolete or simply plain wrong. Technology helps me to adapt, but I'm concerned how people close to me will fair, in a world that is increasingly harsh, bitter and very confused. It reminded me of a video that I saw ages back (turns out it was made in 2002) when Chris Anderson came to explain to the TED audience why he was switching the business model of TED from for-profit to non-profit, turning away from the Internet bubble which had just burst and picking up the pieces. He explains his background in publishing and what he had to do to rethink things. I feel in a similar situation. I built a reputation for myself by building talented teams in Hilversum, many of whom were world class storytellers. I also did quite a bit of storytelling myself in the form of radio, later TV documentaries. I came from a technical background, but realised rather quickly that communication is all about people and stories not the technology. For a while at least, Radio Netherlands, built a reputation for engaging with global audiences and discussing a wide variety of things that were going on around us. A lot of it was beautifully crafted, some of it was unique, and the people who made it were the best in the business. And then the business went away. Not overnight. It just went into a long slow fade. Many didn't see it coming. The tragedy of those involved in international broadcasting was the fact that few made time to collect and preserve what they were doing. We all assumed that it would be kept. And that someone else would select and sort it. And all of this so that other generations would be able to explore, learn and compare. In fact, we were wrong. The teams have long since broken up. And now on-line archives are closing down. On November 1st 2013, Radio Netherlands pulled the plug on many of its on-line archives, so the only way of knowing there was ever an international broadcaster in Hilversum is by perusing the entry for Media Network in the WayBack Machine. The irony is that it is more difficult to find some material after the Internet gained mass appeal than before. Out of personal interest, I kept an archive going with the best of that particular programme. But other equally interesting material hasn't been so fortunate. It's gone. Some has been stored away in the vaults of the Netherlands Sound and Vision Archive. But it is now out of context for the audiences for whom it was intended. So will it ever be accessed again? Because if it's not accessed or curated, how long before it's chucked out or simply crumbles? In fact, where's the evidence that it was ever made? Official viewership numbers weren't immediately available on Monday morning, but the livestream's watch page counts 873,288 views. That's a far cry from the 60 million people said to have voted on the awards or the 10.1 million views on the months-old clip announcing the show. Ad Age counted only 217,244 concurrent viewers thirty-one minutes into the awards show, which seemed on the high end for the nearly 90-minute show. Minutes later during a promotional spot for show sponsor Kia featuring YouTube star Taryn Southern, the figure dropped to roughly 211,000 viewers and later fluctuated from 170,000 to 190,000. Modest numbers for a site that averages more than 1 billion monthly unique visitors each month. MTV's Video Music Awards, the most direct cable-TV comparison, drew more than 10 million viewers in August. I wonder why they went to the trouble of making rather poor special effects, when the original videos on the web are so much better. Compare YouTube's live version of violinist Lindsey Stirling with one she posted on Vimeo two years ago. Spontaneous Me Lindsey Stirling from Psycho-Human on Vimeo.